It's easy to get an amazing look for your next night of Halloween costume parties, taking the entire family trick-or-treating, or attending a fun costume event when you browse this huge selection of All Men's Costumes! From Star Wars and Superheroes to horror movies, clowns, historical, ninjas, and more, you'll love all the choices you have on this page! Are you a superhero wannabe or a villain at heart? Perhaps you’ve always wanted to be a sports team's mascot or an extra in a Star Wars movie. 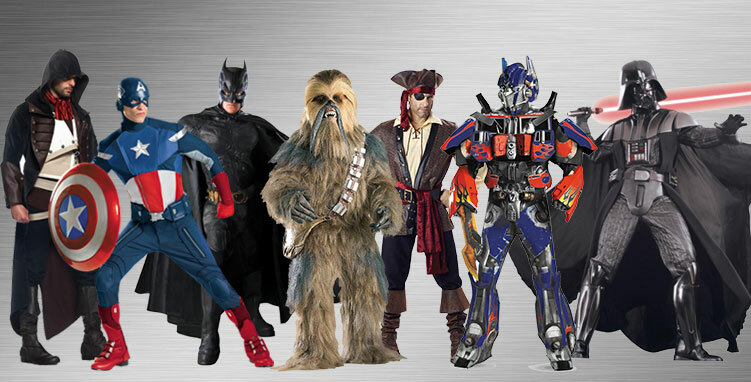 Costumes can transform you into your favorite comic book, video game or movie character, or just the creature to fit your personality perfectly. Choose the fierceness of Optimus Prime and Arno or the ruthlessness of a rogue pirate or Darth Vader. Maybe you covet the courage and strength of Batman and Captain America or the tallness of Chewbacca and Darth Vader. Want to be the talk of the party? Get the kind of attention you deserve. Leave the mundane behind and play out that fantasy with one of our totally authentic costumes. And we’ve got the realistic accessories you can add to complete the look and have some fun. Start turning heads and get the conversation started. It’s easy with a great costume! Character Bios - Who Will You Become? A lion brings fear to the hearts of men. Lions are also very social animals. What a perfect combination for a Halloween or costume party. Or maybe you need mascot attire for your favorite sports team. Whatever the reason, this friendly roaring-lion costume covers you head to toe in lion-ness. Are you the exploring type? Do you gaze at the stars? Live out your childhood dream and imagine yourself as the man on the moon with this authentic costume. Or maybe your favorite movie is Gravity. Fly high till touchdown brings you ‘round, rocket man (or woman). 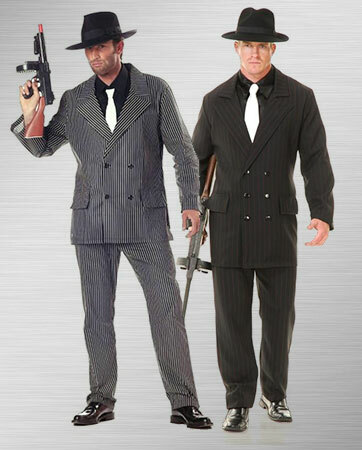 Nothing will prohibit you from having fun in this classic pinstriped suit that Al Capone or John Dillinger would wear with pride. Back in the day, old-school gangsters dressed for success while doing the crime. Whether you’re headed to the speakeasy or the soiree, you can party in style. Gangland style. Now not only can you talk like a pirate, you can dress like one, too. From Captain Jack Sparrow to Captain Hook, iconic pirate characters abound. A landlubber can easily become a swashbuckler with oh-so-real costumes like this. Become your favorite character, or make up your own version of plundering fun. "Life's pretty good, and why wouldn't it be? I'm a pirate, after all?" A knight would be expected to guard the castle and support his liege lord in Middle Ages warfare. He would fight for the king, or the queen. 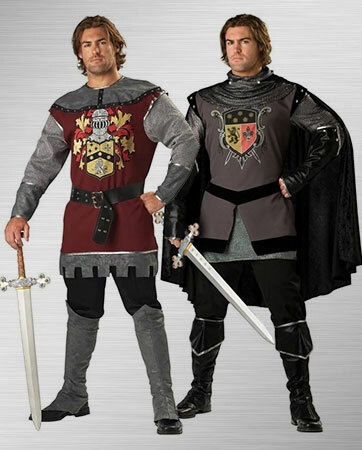 Dare to be a knight and wow the ladies in this dashing costume. Now all you need is a white horse. Who’s cooler than Wolverine? Nobody. The sideburns, the retractable adamantium steel claws, the animal-like senses, the muscles. Take your place alongside the other X-Men with this classic yellow Wolverine costume. And let’s not forget the regenerative healing capabilities, those may come in handy after a party. What’s all the buzz about? It’ll be about you when you put on this great 3D theatrical Bumblebee costume from the Transformers movie. When not in disguise as a Camaro car, Bumblebee looks tough in his yellow and black his Autobot form. You may not float like a butterfly, but you’ll sting like a bee. Intimidate your enemies or impress the ladies (and other gamers) when you masquerade as the formidable Ezio from Assassin’s Creed. A Florentine nobleman during the Renaissance and the mentor of the Italian Brotherhood of Assassins, he rose to the rank of Master Assassin. His cape and hardware are ultra-cool. Swashbuckler films have made pirates oh-so-cool and pirate costumes the most sought-after fantasy frocks around. Who doesn’t recognize the fictional pirate Captain Jack Sparrow with his iconic beaded beard? He’s a hipster pirate and a ladies’ man. 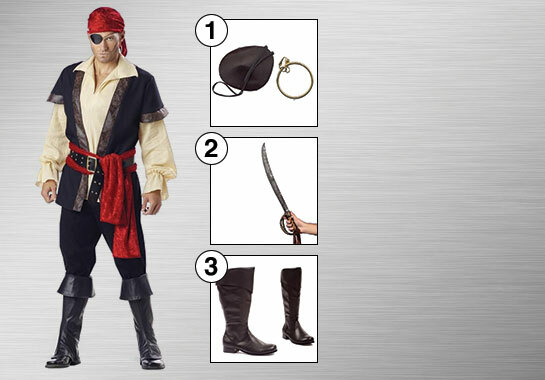 Whether it’s for a Halloween party or a Renaissance Festival, a Captain Jack costume is a must-have. Maybe dark and fearsome are more your style, so why not be Blackbeard? He was a calculating leader known for his thick black beard and for tying lit fuses under his hat. Wow. Or you can make up your own pirate persona. You can be ruthless, a rogue or just plain rustic. 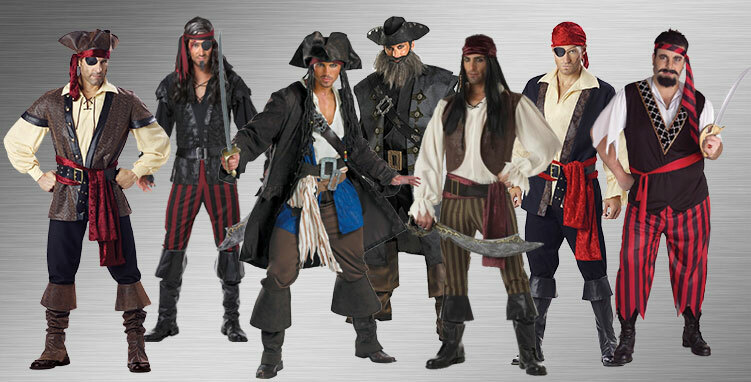 We’ve got a vast array of pirate costumes to choose from, all variations on a very popular theme. Pirate costumes have the best accessories, like swords, eye patches and earrings. A parrot on your shoulder is optional, but always well-received. Protect the kingdom or just your queen in a realistic knight costume and accessories. Be the hit of the Renaissance Fest or Game of Thrones party. Go back in time and re-create the nobility and bravery of the knights of the realm. You won’t have to lay down your life, just a few bucks. We do need another hero. A superhero. 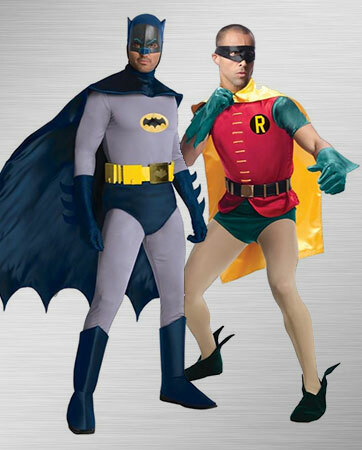 Whether it’s Batman and Robin or another dynamic duo, superheroes work best as a team. Or get together a group of your friends and go as the Avengers. Powers joined together are mightier than one. And who doesn’t love a theme? 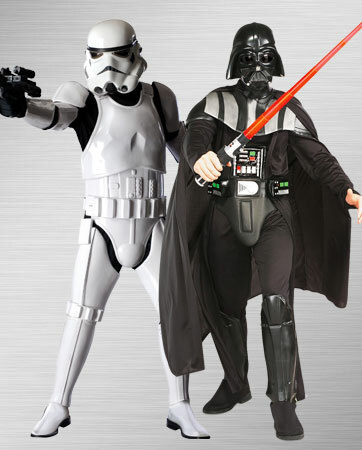 With another Star Wars movie in the works, now is the time to jump on the nostalgia bandwagon and get a great costume for your next soiree. Darth Vader is a classic villain and all you’d have to do is some heavy breathing. And let’s face it, Stormtroopers are the coolest. Mobsters from the ’20s and ’30s were by far the best-dressed criminals in history. Their sense of style probably exceeded their sense of fair play. To play the part, you’ll need a double-breasted suit with pinstripes, fedora and shiny shoes. And if Prohibition ever comes back, you’ll be ready. If ordinary isn’t enough and authenticity is important to you, our Batman Dark Knight costume from the Batman Grand Heritage Collection is the answer to your bat signal. Gear up to fight crime and save the citizens of Gotham. This costume includes a black bodysuit and realistic molded armor pieces worn on top. 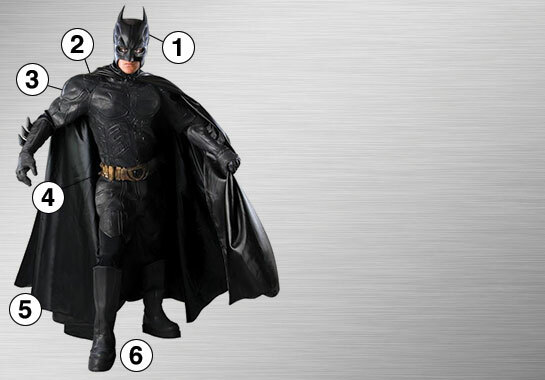 Complete with Batman’s accessories, it also includes gauntlet, utility belt and boot covers. Use the over-the-head mask to conceal your identity. The cape has a scalloped bat-like hem that drapes over your back, completing the Dark Knight look. Just add black boots. Be secure in the knowledge that this is an officially licensed Batman The Dark Knight product. You can almost feel the excitement of battle as you put on the full-sleeved gauze shirt and embossed vest of the Pirate Elite Collection Adult costume. Fasten your belt with its gold metal trim, tie on your bandanna and sash, and then secure your black leather-look boot tops. Add a custom-molded eye patch, hoop earring and fold-over cuff faux-leather boots to complete the ensemble. Then add the ultimate accessory, a sword. Our pirate sword has intricate carvings on the blade and an authentic fabric strap. It even has rust stains to make it look genuine. Look like the real deal and still have some treasure left in your chest.